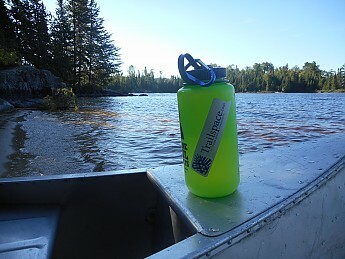 An early morning on Horse Lake in the Boundary Waters. It is surprising to see so many aluminum canoes in the "land of portages." Are they part of the rental fleet? As much as we griped on portages, the cost of renting aluminum was 1/2 the price of lighter canoes. With 1/3 of our party living on the salaries of non-profit organizations, every penny counts! "With 1/3 of our party living on the salaries of non-profit organizations, every penny counts!"